Our Chef combines with originality the most traditional Tuscan receipts with the best elements of every Italian regional cuisine. On top of the quality of food, we offer a stunning location for our restaurant, with a panoramic terrace overlooking the west side of Val d’Orcia in summer and an elegant dining room in winter. Castello di Velona is the right place for wine lovers: an important wine list where stands high the Brunello di Montalcino produced in our own 32 hectare-winery, well known also for its exquisite “prima spremitura” olive oil (olives are handpicked and pressed in carefully selected traditional methods the day of the first cold pressing). The ancient cloister of the Castle is the pulsating heart of our Resort; sheltered by an elegant crystal cupola, our Guests can enjoy refined distillates under the enchanting Tuscan starry sky. The Taverna al Vignone features a rustic and comfortable atmosphere where our Guests can taste Tuscan specialties characterized by the special touch of our Chef. From breakfast to lunch, what better plan than lingering in the shadow of our gazebo! 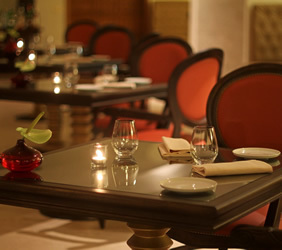 Our indoor dining room can welcome up to 60 seated guests, as well as our panoramic terrace. The new gourmet restaurant Abbazia offers an incomparable view of the west side of Val d’Orcia, as every area located in the new wing of the property. In front of breathtaking sunsets, our guests can enjoy refined and tasty Tuscan dinners, surrounded by the most romantic frame they could dream of. Right by the pool and the Spa, our Pool Bar is at your disposal during the whole day in order to offer you refreshing drinks and restorative breaks.